What Is The Best Ice Scraper For Your Car in 2019? →What Is The Best Ice Scraper For Your Car in 2019? Regardless of your location and how often there’s snow where you reside, you should definitely have an ice scraper for your vehicle. However, which ice scraper you will choose will depend on many factors, including the frequency of snow, type of snow, as well as the size of your vehicle. You should never settle for that tiny area you managed to defrost on the windshield. This puts you in a great danger, and such danger can be easily avoided if you make a small purchase. Just decide on the snow scraper that serves your purpose best, and make safety your priority. Surely, the range of ice scrapers on the market is enormous, which can put you in a dilemma. This list should help you make your decision. What Can Happen If You Don’t Use an Ice Scraper? What Factors Should You Consider When Choosing an Ice Scraper? What Types of Ice Scrapers Are There? How Should You Use The Ice Scraper to Clean your Vehicle? What Shouldn’t You Do When Using An Ice Scraper? The Dart CB99 62-Inch Snow Brush and Ice Scraper is the best-selling in 2018. Offering a whopping extension of 62 inches, you can use it on any vehicle and reach even the toughest spots. The brush of the Dart CB99 is made of heavy plastic and metal, which makes it very durable. In addition, this product features a grip that is padded, making it more comfortable for use. If you choose to purchase this product, you should probably know that it costs a bit more than a regular scraper. In addition to being a two-in-one product, it features a blade that you can unclip to clean the hard-to-reach areas. 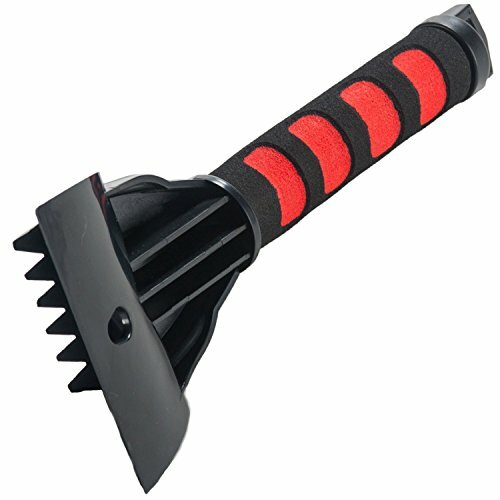 For those who search a more affordable option, the Primary Automotive Rocky Mountain Ice Scraper is an excellent choice. Featuring a shorter design, this ice scraper is very easy to use if you have a small vehicle. With a grip covered in foam and a size that fits perfectly in your fist, this is an excellent tool to use when you want to remove the snow from your vehicle. The Primary Automotive Rocky Mountain Ice Scraper is very affordable, but if you have a larger vehicle, you may want to consider buying an ice scraper with higher extension possibilities. The product has two main features – a claw you can use to break up the ice, and a plastic chisel that helps you remove it from the vehicle. The plastic material helps you protect your vehicle’s paint job from damage in the cleaning process. Purchasing this product will also give you a waterproof-storage bag where you can store the item. SnoBrum Original Snow Removal Tool is an excellent show brush and an ice breaker, but it is not highly recommended for thick layers of ice. If you aren’t located in an area where you need to clean heavy snow, this is a great tool to use for all types of vehicles. 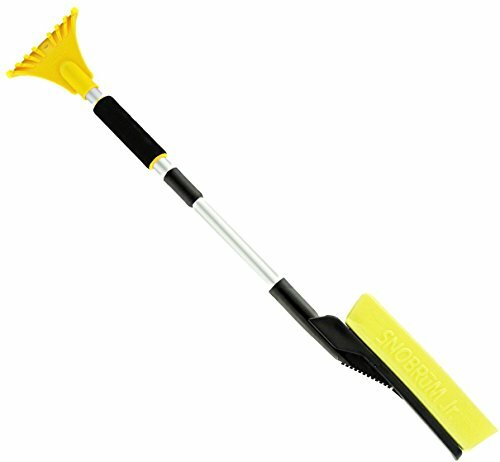 Our third choice is the SnoBrum Original Snow Removal Tool, perfect for cleaning heavy snow and very accessible. The product has a telescopic handle that extends out to 46 inches in length, making it possible for you to use it on small and large vehicles. 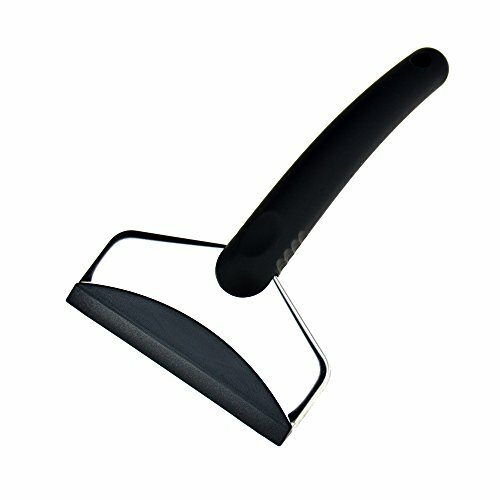 At the end of the handle, you will find a head made of durable polyethylene foam. The material makes the head very sturdy, guaranteeing that it won’t buckle or bend when you push hard to remove heavy snow load. Moreover, the material is very safe to use on your vehicle, which means that you won’t be scratching the car paint, glass, or other delicate areas. 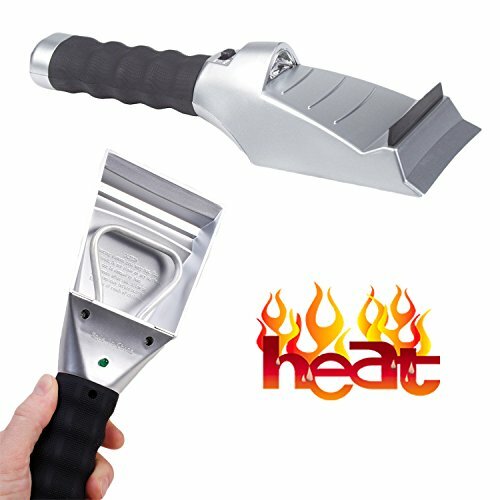 Built from very durable materials, the RevHeads Ice Scraper can be used in extreme temperatures. Its handle is short which makes it hard to use on larger vehicles, but if you have a small vehicle, you will find the size perfect for storage and use. With a handle that extends out to 6 inches only, you should definitely reconsider this choice if you have a large vehicle. However, if your vehicle is small, this is a very durable, excellent ice scraper that will help you scrape off the ice within minutes. Combining a foam grip for comfortable scraping, and a small size for easy storing or hanging, this is a great tool for those will little storage room or patience to clean the snow. For those who prefer to use a mitten to keep the car surface smooth and undamaged, you will surely appreciate this combination of a mitt and a scraper. Even if you choose not to use the mitt, you will find it very soft and warm to use. Cleaning ice and snow off your vehicle is not easy, but is also freezing-cold! 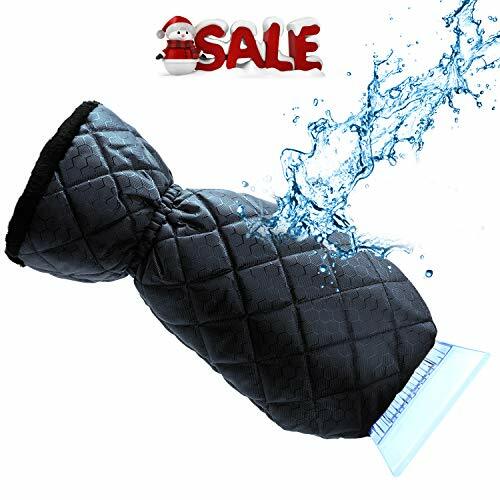 To avoid this, the Dragon Squama Ice Scraper Mitt combines a waterproof mitten with warm fleece lining in the interior, and a basic ice scraper connected to it. This tool will help you keep your hands warm and dry when cleaning your vehicle, but it is not made of a material that can break or clean very thick ice. If you wish to clean thin ice off a smaller vehicle, this is perfect for you. Purchasing a two-in-one snow cleaner piece may be just what you needed to minimize the products in your vehicle storage. 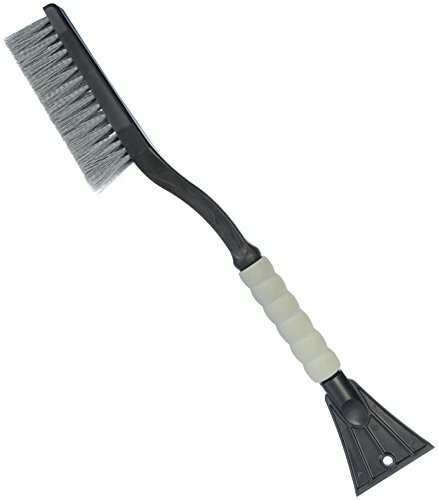 As the name of this item suggests, you are looking at a snow brush and an ice scraper. For less than $10, you can purchase the two items you need to keep yourself safe while driving in wintertime. The AmazonBasics Snow Brush and Ice Scraper is a nice combination that will help you clean both ice and snow off your vehicle, and it has decent quality for the amazing value. The length of 25 inches makes it hard to reach and clean larger vehicles, but it is sufficient for smaller ones. In addition, the collar is made of foam, which makes for a secure and comfortable grip. Are you tired of constantly having to scrape off the ice from your vehicle? The heated ice scraper makes it possible to reduce the time you spend on cleaning the vehicle, since heat melts the ice and aids you in the process. To reduce the time spent on scraping your vehicle and minimize the damage you can make on its surface, use the Perfect Life Ideas 12-Volt Heated Ice Scraper. As the name suggests, this tool heats the ice and melts it, making the process much faster and simpler. Unfortunately, you must use power to warm up the ice scraper, so you may not be able to use all its features on the road. But, you will find its cord to be extremely long, 12 foot to be precise, allowing you to access an entire vehicle. Even the bigger ones. Seeing your car covered with snow is bad, but seeing it covered with ice is worse. Not only because it is exhausting to constantly scrape ice off the vehicle whenever you need to go somewhere, but also because this can do much damage to your car. If you remove the ice and snow from your vehicle, this will save you from very high repair bills for damage later on. And the repercussions are even bigger than those with snow. When the water freezes, it expands on your vehicle. This can break off some of the paint, and create body damage, such as rust. There is a wide range of brushes and scrapers to purchase online, but not every product is a good pick for your specific vehicle and needs. The ideal scraper for you is one that is tough enough to scrape off the ice you need to remove, strong enough to endure low temperatures and force, and soft enough to keep your vehicle safe from scratches. In addition, you may prefer to get one with a comfortable grip, or a length that will allow you to clean the entire vehicle with ease. If you have a larger car, you should definitely consider purchasing one that is highly extendable. The short scrapers are great for smaller vehicles, but not very effective for larger ones. If you have a small car or are tall enough to reach all areas with a short scraper, you can find many great short-handled scrapers. For those who need to clean larger vehicles or prefer a more comfortable and faster experience, the long-handled scrapers are a better choice. Ice scrapers can have different extension options, so choose one that is fitting to your vehicle and preferences. One item in our list offers such a combination. Protecting your hands and clothing from the cold and wet snow is important, so you may want to consider buying an ice scraper attached to a glove. Of course, this means that you will have to buy a snow broom separately, since the scraper is usually attached to the glove itself. This also makes the product great for smaller vehicles, but not for large ones. Scraping off the ice is not really rocket science, but should be done with care. You need to apply force and push the scraper downward and forward, or pull it toward you. Of course, whether this will damage the surface of your vehicle or not, it depends on the product you purchase. When cleaning the side windows and the side view mirrors, apply less force. Don’t smack the ice with a piece of wood, hammer, or metal. This can easily shatter the windows. Don’t use a snow shovel to brush off the snow. It will scratch the car paint or shatter a window. Don’t start the vehicle unless the radiator grill and exhaust pipe are completely cleaned of ice. Don’t leave your vehicle unattended when you see ice on it. The radiator can freeze, then overheat and destroy the engine. Don’t pour boiling water to melt the ice. The differential in heat will crack the windows. Don’t turn the wipers on until you clean them completely. Have you found an item you like? Don’t forget, there is much more to look for when choosing an ice scraper than just the color and size. In addition to your preferences and budget, you must also look at the quality of material, the size of vehicle, and safety measures. Rushing and buying any ice scraper can cause damage to your vehicle, or danger to you and others. This may not seem as such a serious thing at the moment, but choosing a suitable ice scraper can save you a lot of trouble at low temperatures.